On Saturday Jan 22 I attended a swapshop at TEFL de Sur in Cádiz. It was organised by the wonderful Teresa Bestwick. There was a great atmosphere with about twenty teachers from various different backgrounds working in various different schools in the area sharing their favourite teaching ideas. Each teacher took it in turn to stand up and share an activity with the group. They ranged from five minute warmers to extended speaking tasks, for YLs, teens and adults. I first used this activity with a class of teenagers in Italy. The mixture of putting the teacher on the spot, silliness and hard work appealed to them. It has since become my number one favourite last minute standby lesson for intermediate and above and for almost all ages from young teens upwards. (It also works for review classes at the end of a unit of work). It has its roots in an activity in Mario Rinvolucri and Paul Davis’s Grammar Games but has evolved and changed over time. What I like about it is that it’s totally materials free, needs no preparation, has a very tangible outcome and offers great opportunities for working with emergent language. Write the letter on the board and brainstorm words that start with that letter. Don’t stop until the board is covered in words. This could also be done as a board race, with teams passing the board pen to their classmates as they race to fill their half of the board (it really doesn’t matter if the words are repeated). Here’s an example in wordle of the letter B. (If you have a projector and wifi connection in class you could create your own wordle as you go). You might want to do something with the words on the board to help students process them. For example, ask the students to work in small groups and categorise the words in three groups, they choose the categories. Or ask them to group them by word class (nouns, verbs, adjectives). Or ask them to choose their three favourites and least favourites and explain why. Ask the students to choose a word on the board at random. You can ask them to shout it out, or you can leave the room and give them a time limit (30 seconds, 1 minute) to choose the word. Once they’ve chosen the word, explain that you are now going to have to talk about that word for two minutes without stopping (a kind of version of Just a minute, but repetition, hesitation and so on are not penalized!). Ask one of the students to time you. Take 30 seconds to gather your thoughts and then go for it! When you’re talking, try to cover at least four or five different sub topics, linking them as you pass from one to the other, no matter how tenuously. You are basically setting up a model for the speaking and writing tasks to come. You can ask students beforehand to focus on how many sub topics you cover and to take notes if you think they need a task to focus their attention. I’ve found that on the whole the mere fact of the challenge is enough to keep them listening. Explain that the students are now going to have to repeat the same task. But explain that you’re going to make it a little easier for them in three ways: 1 you’re going to let them choose the word, 2 you’re going to let them work in pairs or small groups, 3 you’re going to give them 30 seconds each to talk about their topic (this can be extended to a minute for more confident/competent classes). Each group takes it in turns to talk about their word, their classmates make notes about the topics covered as they listen and give a mark out of five for 1 fluency (ie lack of hesitation, not drying up) and 2 interest . After each mini presentation the students who were listening compare notes in pairs or small groups, or simply gather their thoughts before the next “act” is on. In the past I’ve sometimes taped the presentations to play them back, or prepare transcripts. Nowadays I’d be more likely to record them using a programme like audacity or audioboo so we can share the file outside the class. During the mini presentations I make notes on any new vocabulary, recurring errors or interesting language areas to look at later. You can choose to look at these immediately after each presentation while the listeners exhange notes, in a whole class feedback session after the speaking stage, or during the writing stage. This stage can be set for homework, but I prefer to do it in class because it offers such a great opportunity to work with the students’ language as they are using it, negotitaing meaning, inputting new vocabulary and working with problems as they emerge. Basically the students present the same ideas in writing. I write the opening paragraph for my mini-presentation on the board and we look at the idea of paragraphing, discussing the need (or not) to dedicate a new paragraph to each sub topic. The students write collaboratively or individually (this is the point where the teacher can monitor and offer support, as the text is being written) and then hand their text to a student from another group who comments on whether the written version matches the spoken one. I collect the texts and use them as a basis for working on text cohesion and linking in the next lesson. If I’ve recorded the spoken task I might ask them to write out their own transcripts for homework. They can present them to me with or without corrections and we can look at them together in the next class. 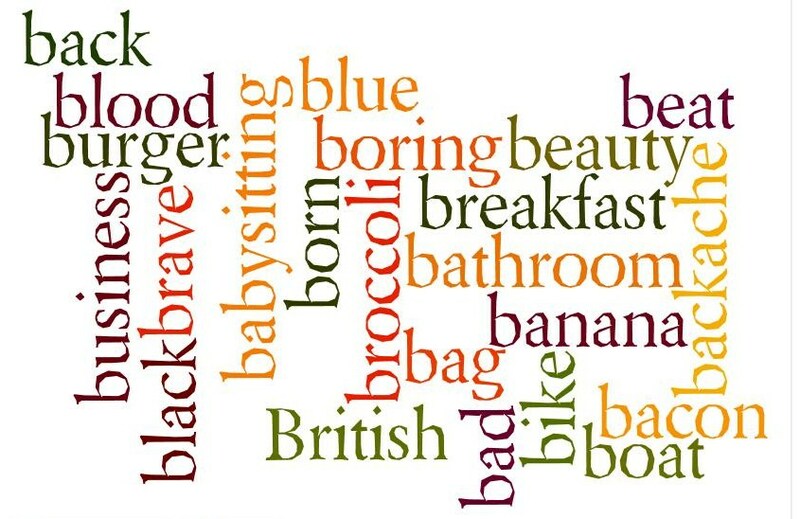 If students seem willing/interested, they can choose a second word from the board and repeat the task at home – either recording themselves (they can use audioboo or add an image and use voice thread or fotobabble), or in writing (their new texts could be added as comments or posts on a class blog). Lesson in a box! What a great idea, Ceri – and I love the way that it gives the students so much structure and presents the task to them in a fun way before they have to do it themselves. Thanks for organising a great event. I’m really sorry I had to leave early. Long time no see! (think IHYLC at CLIC… when was that? ages ago) Looks like you’re doing pretty well – I’m glad. I’ve moved away from Seville, otherwise I’d pop down to one of your TEFL del Sur meetings. I set up something very similar when I lived in Tenerife (Atlantic Language Forum, heehee) – it was a great way to provide a staffroom for freelancers, and opositores as well as being of use for academy teachers, and we had teachers of other languages too. It was really great fun and useful for everyone on all sorts of levels. So good on you, and a big Friday smile for you. Fantastic! I love these zero prep ideas. Thank you so much for sharing this. I’ll do my best to share it with teachers around the world!